North Korea has celebrated its 70th birthday with a huge show of military strength while it refrained from showing off its intercontinental ballistic missiles. 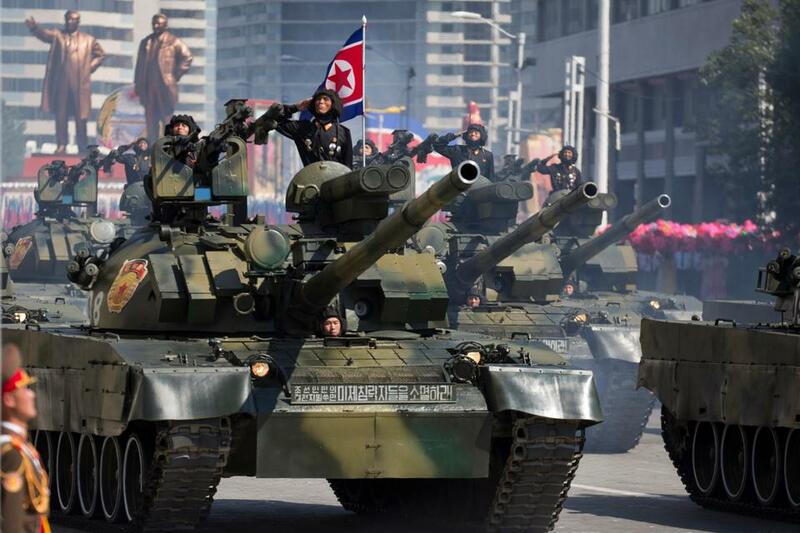 North Korea rolled out some of its latest tanks and marched its best-trained goose-stepping units through Kim Il-sung Square in a major military parade on Sunday to mark its 70th anniversary, but held back its most advanced missiles and devoted nearly half of the event to civilian efforts to build the domestic economy. The strong emphasis on the economy underscores leader Kim Jong-un’s new strategy of putting economic development front and centre. Tens of thousands of North Koreans waving brightly coloured plastic bouquets filled Pyongyang’s Kim Il-sung Square as the parade began. At the end of the two-hour event he strolled to the edge of the balcony with the Chinese special envoy, Li Zhanshu, who is also the third-ranking member in China’s ruling Communist Party. The two held up their joined hands to symbolise the countries’ traditionally close ties, though the absence of Chinese President Xi Jinping could indicate Beijing still has some reservations about Kim’s initiatives. Senior statesman Kim Yong-nam, the head of North Korea’s parliament, set the relatively softer tone for the event with an opening speech that emphasised the economic goals of the regime, not its nuclear might. He called on the military to be ready to work to help build the economy. After a truncated parade featuring tanks and some of its biggest artillery, fewer than the usual number of missiles and lots of goose-stepping units from all branches of the military, the focus switched to civilian groups ranging from nurses to students to construction workers, many with colourful floats beside them. The North also refrained from immediately televising the event, though North Korean media were out in force to film it, deploying booms and — for possibly the first time — drones with cameras. Soon after the Sunday celebrations end, Kim will once again meet in Pyongyang with South Korean President Moo n Jae-in to discuss ways to break the impasse over his nuclear weapons.